The humble kote gaeshi - wrist out turn throw/projection/lock - is arguably the most ubiquitous small joint technique seen in traditional martial arts. 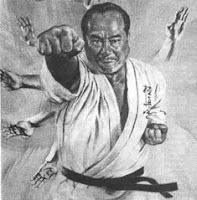 It is a mainstay of aikido and its parent art, Daito ryu jujutsu. It appears to have been adopted by many karateka as "one of their own" (even though it is often hard to see it in kata). 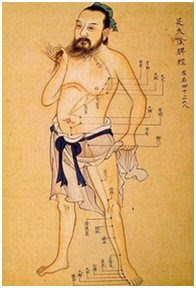 And the technique is certainly common in qin na - the grappling that accompanies many of the traditional Chinese martial arts. By contrast, the kote gaeshi is hardly, if at all, seen in modern combat sports. 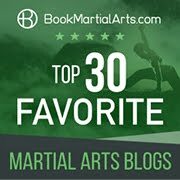 In fact, I have been surprised by the number of combat sports practitioners who have said to me over the years that they consider it to be a "fanciful" technique that certainly "won't work in a real fight". Yet I consider it to be a supremely useful lock - the second most common one that I apply in hard, stand-up sparring (the arm bar being the most common). Why this disparity? I believe it has to do with some fundamental misconceptions about how to apply the kote gaeshi, in particular the correct use of footwork and application of body weight. (b) a circular movement (tenkan) - where you you continue your attacker's forward momentum and redirect it back onto the attacker. The application of kote gaeshi using this method is illustrated in the adjacent gif. 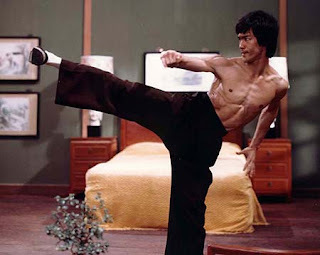 [A]ttempting to catch and continue/redirect the extremity of a limb (eg. a hand or foot) is, in my experience, practically impossible given the usual speed at which an attacking limb is travelling at the point of interception, the speed of typical human reaction and the fact that you are not entering into, and utilising, the centre of his/her "circle"." In other words, I think it unlikely, in the extreme, that you will be able to continue the forward momentum of a punch by catching your opponent's hand/wrist. You might well catch your opponent's hand/wrist - but only after the inital contact of your limbs (eg. while deflecting) when you can establish some kinaesthetic awareness. And given that street attacks are hardly likely to resemble a full, committed step with a punch (as seen in karate or aikido basic practice), by the time you catch your opponent's hand/wrist, he/she is almost certainly going to be pulling back - or doing something else. You can be reasonably sure that your attacker won't still be pushing forward with the original attack. For these reasons, the first phase of the classical kote gaeshi I demonstrate above (ie. leading the forward momentum using irimi and tenkan) is unlikely ever to be applied in a civilian defence scenario, or in sparring. Catching hands on their outward movement is, in my opinion, largely fanciful. By contrast, the second phase of the kote gaeshi (where I lead the "reversed momentum") is not only possible - it is quite practical and useful. As I said at the outset, it is the second most common lock I apply in standing sparring, particularly in the melee range where striking and deflecting/trapping start to merge with grabbing. As with irimi nage, it is possible to isolate the second phase of the kote gaeshi and not go through the inital leading of forward momentum. The adjacent gif illustrates this technique. You will notice from this gif that there is an initial deflection which is usually accompanied by some kind of body shifting (taisabkai) or evasion (tenshin). This body movement might or might not involve irimi (entering). It is during this initial deflection that contact is made with the opponent's attacking arm. As discussed, a grab on first contact against a hard and fast punch/strike is unlikely. In any event, your goal at this point should be to avoid being hit - not to grab. However, that inital contact gives your body a vital kinaesthetic context. And using this context your brain can compute and estimate (with reasonable accuracy) where the limb will be in a moment's time. Accordingly I have found that it is possible to establish a grab in the half second or so following the deflection. As I say in the above video, there are a few important points to remember when executing a kote gaeshi while leading "reversed" momentum (ie. applying a kote gaeshi to a hand that is being withdrawn). To harness this reversed momentum, you need to be quick. In fact, you have to move "in synch" with your opponent. If you delay, the hand will be withdrawn and you will have lost your chance. And the key to staying "in synch" lies in your footwork. Always move the leg that is closest to your opponent - and do so in the direction of the withdrawal. By way of an illustration, stand facing a partner with your right leg forward and your left leg back. Stand close enough that you can put your palm on your partner's chest. Now lift your front leg. You will notice that you instantly exert force on your partner. This is because your body weight immediately falls behind your hand. Next, see what happens when you move your back leg - start to step forward. You will note that, unlike moving the front leg, moving the back does not exert any force until your back leg crosses the vertical mid-line of your body (ie. when your back leg is passing your front). This should give you a clue just how important it is to move the correct leg when applying kote gaeshi. Given the speed at which your attacker is going to be withdrawing his/her hand, you need instant application of force in the direction of the withdrawal. Moving the front leg in the right direction gives you that instant force by applying your bodyweight to the task. Moving the back leg does not. The adjacent gif shows this footwork more clearly. In this exercise I have assumed that the withdrawal of the attacking punch will be straight back, but in reality it could be at a variety of angles. In my experience you can discern the correct angle as the withdrawal starts to occur, permitting you to "go with the flow" and apply the withdrawn momentum against your opponent. 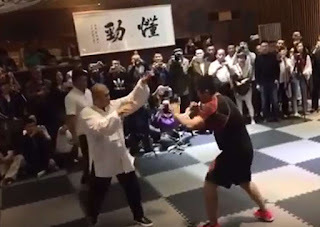 It is my view that the failure to apply kote gaeshi against resistant training partners (or attackers in civilian defence scenarios) is largely a result of incorrect footwork. You will note that even in the gif at the start of the article (where I demonstrate the full, classical kote gaeshi), I still apply the footwork rule outlined above. 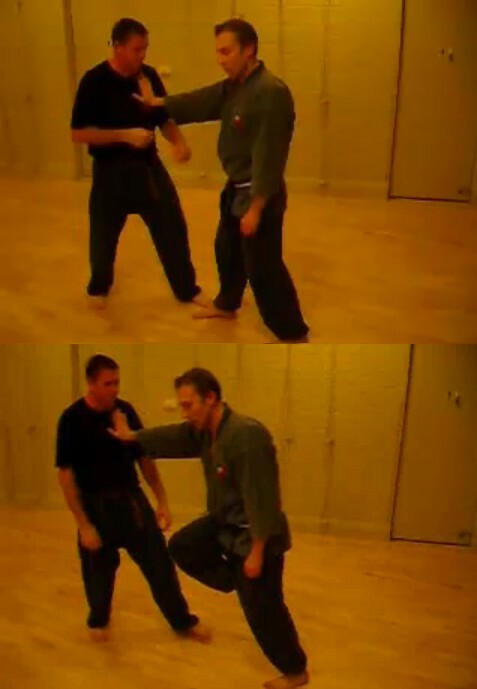 The adjacent gif demonstrates the variant of kote gaeshi that I was shown when I first started training. In it you will note that the defender does move his front leg when applying the kote gaeshi. However he doesn't step in the direction of the (inevitable) withdrawal. Instead he moves directly opposite to that withdrawal - ie. he pulls his attacker forward. This would be fine if he were leading forward momentum (assuming this were at all practicable). But in his demonstration there isn't even the slightest suggestion that the attacker's momentum will be moving forward. What would happen if he tried to apply this against a resistant attacker? I suspect that the attacker would simply pull his hand away. And even if he didn't, the kote gaeshi would still fail. Why? The defender would not be in a position to utilise his bodyweight. And in order to apply any throw/projection, you must use your bodyweight. Where does this defender place is bodyweight? He pulls it far away from his attacker, opening up a gap between them. To effect any throw/projection you must be close to your opponent - "hip to hip" even. You don't get there by stepping away and trying to "drag" your partner with you via outstretched arms. The adjacent gif presents an attempted "cure" from the problems encountered in common mistake #1. How? In this case, the defender is apparently aware that he shouldn't open up a gap between himself and his opponent. So he first makes a step towards his partner with his back leg, and only then executes the forward kote gaeshi (as per the common mistake #1). In other words, the technique is the same, but for the extra step-up at the beginning. The problem with this should be obvious: First, he's moving his back leg - which we have already noted does not apply immediate force to the kote gaeshi. Indeed, the defender doesn't expect it to - he's simply positioning himself for the next step in which the kote gaeshi will be performed. In other words, the defender is deliberately taking an extra step which has no direct bearing on the kote gaeshi. This extra step takes time - time you just don't have. It seems to work well enough if your opponent is happy to just stand there. But if your opponent moves, all bets are off. 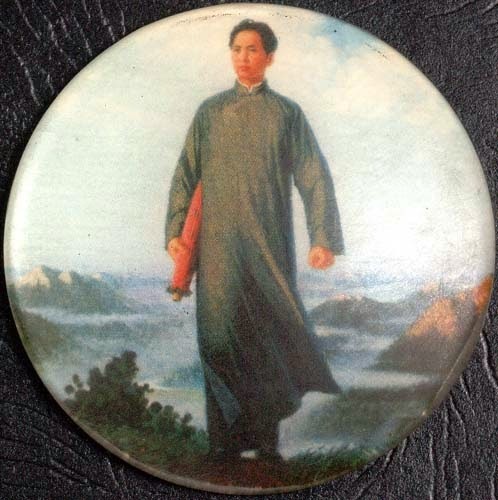 Kote gaeshi - as with any other throw/projection - works on a "one for one" principle: for every one movement your opponent makes, you must answer with one movement. In other words, your throw must be one movement in answer to his/her attack. Through correct footwork, you can connect your deflection and throw so that they become part of a single continuum, enabling you to respond effectively. Extra steps just don't fit this equation. Common mistake #2 wrongly assumes that your opponent will be motionless during the extra step(s) enabling you to position yourself correctly. Against a resistant partner you simply don't have that luxury. In the above gif, the extent of the "mistake" is disguised to some extent by the fact that the "attacker" is initially bent over. The extra steps occur while she is straightening up. However her bent posture in no way requires the extra steps. Moreover, note the time it takes for the kote gaeshi to be applied and compare it to the gif of me doing the kote gaeshi earlier in the article. Common mistake #2 takes roughly 3 times as long as my "direct" version. Kote gaeshi is often dismissed as an ineffective throw/projection/lock. However in my experience it is nothing of the sort. The reason it is dismissed has, I believe, a lot to do with how it is taught. In particular, some instructors appear to assume that because the kote gaeshi is a wrist-based throw/projection/lock, the usual principles of grappling don't apply. Nothing could be further from the truth. As with any grappling, the need to harness your own bodyweight - and use the attacker's weight/momentum against him/her - is paramount. This requires you to be close to your opponent. You simply can't effect kote gaeshi by pulling away from an attacker. Nor can you bargain on your opponent staying still while you carefully position yourself. Instead, as with any judo throw for example, you must be in the right place at the right time. You must predict where your opponent is heading and "lead" his/her momentum in that direction. Above all, you must take care to keep your body close to your opponent. 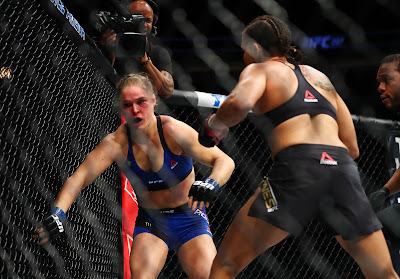 Grappling just doesn't work as a "long-distance relationship". And kote gaeshi is nothing if not grappling. I train in Krav Maga, and we use a wristlock we call the cavalier. I can't say for Kote Gaeshi, but the principles of when to use it are more or less how you described. Unfortunately, I'm unusually slow moving, and a bit inexperienced, so I haven't managed to apply it in sparring, but when drilling a deflection, I find it comes naturally if I drive into my opponent (While punching them, in a real life application) before just letting them move backwards and locking the wrist. I am glad to see you are posting again. And what coincidence! I just started an aikido class at my university, and I get some good advice right away. Kudos, sir! Kudos! Two great articles in a row -- I can't believe my luck! Yep, I really like the kote gaeshi wrist lock...it's so simple yet so effective when used correctly. Your analysis of what makes these techniques work has really helped work out some of the kinks I had in my mind about the whole subject...now I understand it a lot better. I noticed how much easier it is to apply a grapple when you have contact with the opponent already. Because wing chun chi sao and Taiji push hands are hard to use when exchanging blows, people just write them off as useless exercises. My personal opionion is that they contain important skills for striking, but they really, really shine when grappling, where the control of body energies is vital. The gif you took was from the Submissions 101 guy...lol I actually like him, he makes good grappling videos, didn't know his kote gaeshi was off though ha ha. But it makes sense now that you pointed it out, and I agree. Thanks Joshua. I like the submissions 101 guy too. He is doing a very common variant - I used to do it. So I'm not really being critical of him - but pointing out a better way. As I say, many of us were taught a "traditional" way that I think has some fundamental issues. And by the way, if you take a look the submissions 101 guy doing kote gaeshi fast, you'll see that he stops moving straight back (as he and I were both shown) and starts moving a bit to the side. I think his own body is telling him not to make such a big gap but this conflicts with his "classical" teaching. I was taught a kotegaeshi ura variant where we were directing the opponent's gravity very low (while continuing the attacker move), as if you were plunging his arm like a shovel. Hvala lepo Yin - puno pozdrava iz Pertha! I had another look at this article and your 'leading momentum' article after your post over on the Rum-Soaked Fist. I completely understand what you are saying and agree with your criticism of Aikido in this regard, at least as it is commonly practiced. However, a line of thought occured to me which I thought of sharing, which is that it is not the fault of Aikido per se, but only the way in which it has been commonly practiced and understood. I think what you are partly describing in these posts are the differences between the 'omote' and 'ura' versions of the technique: either taking advantage of the opponent's forward momentum in one, or reverse momentum in the other. The main point being to join with the opponent, however you want to call it (blending, joining centers, aiki, ki-musubi) and from there make use of whatever resistance or movement the opponent gives you: forward or reverse. Essentially I agree with you and think the fault lies in an incomplete understanding of the combative philosophy of Aikido, rather than in the art itself. 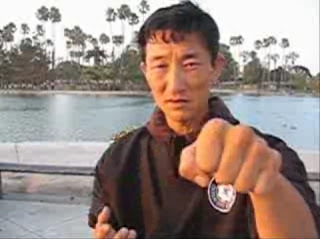 And that understanding both the 'omote' and 'ura' versions completely for any given technique are essential to completely mastering that technique and being able to use it against a resisting opponent in any real world scenario. Another thought occurs to me in defense of Aikido training in this regard which I'll hope to share when I have some more time. Actually I agree with Angelo. I think this isn't a fault with Aikido (which is an art that I greatly admire) but rather a point of disagreement as to the way in which a particular technique (kote gaeshi) ought to be practised in general terms (particularly as regards the footwork). Completely agree with Angelo here, although what he calls ura and omote would need some precision here but that's minor. 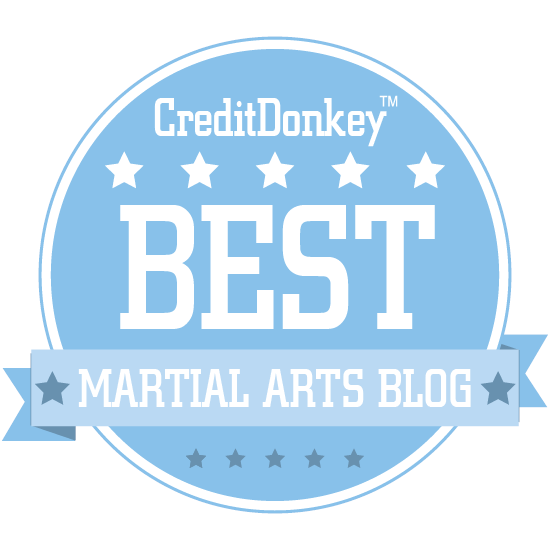 Modern mainstream aikido teaches the wrong basics, starting with the most fundamental elements: foot position, foot work and body moves logic. Once again irimi nage and tai no henka are just misunderstood nowadays. In that respect you are absolutely right and your sparring has lead you to conclusions similar to the old guys. I was wondering, why didn't you use a center line hand deflection to ensure the incoming fist tsuki would not be able to make contact with you while you moved around? In Aikido, I often see the total taisabaki evasion without touch contact, but in Taiji Chuan, the deflection defense is always there and there's no assumption that simply body evasion is going to do the job. The backup is always there even if it is not needed to deflect, it's also there as a sort of sensitivity touchstone to ensure that one doesn't need to see the arm to know where it is and grab it. 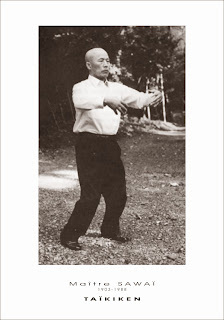 If the rumors are true and Morihei Ueshiba studied some Taiji Chuan or another internal art like Bagua zhan, then it would be interesting to see how he modified things in his aikido.